I've done a fair bit of printing in nylon recently, using Taulman3D's 618 material. 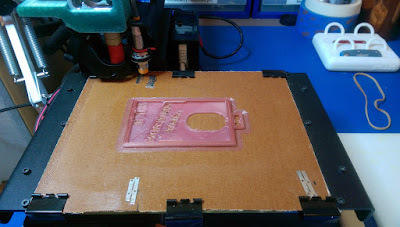 I've had pretty good success in the past with using my favourite combination of a cold bed covered in Kapton tape and glue stick, and had virtually no bed adhesion issues with single walled prints, even large ones. I have noticed though that when you combine a large print with multiple layers, you still get some corner warping and I had several failed jobs due to this. I remembered reading on RichRap's blog a long time ago that Tufnol was a good solution for Nylon based products and grabbed a couple of sheets of it ages ago. Tufnol is a cellulose and resin product which is compressed into very flat, flexible sheets. Its also very tough so can take the high temperatures required for Nylon printing, along with some bending to remove well stuck parts from it. The reason I hadn't used it thus far was because I couldn't figure out a reliable way to have the Printrbot perform it's auto-bed level routine with the inductive probe. I'd tried a couple of solutions in the past using aluminium baking foil on the probe landing spots, but this proved to be very unreliable. One of my most recent jobs is to create a bunch of ID pass holders with some branding for my team - I wanted these to be tough and flexible, and I needed to create around 10 in total, and was having issues keeping the things stuck down due to the 4 bottom layers warping a lifting off the bed before the prints completed. This was getting very annoying and I was only averaging one in every five attempts being successful, which is just a waste of time and materials. So, I decided to give Tufnol another try. I cut down a sheet to the size of the PBSM bed with a craft knife by scoring it repeatedly until I could break off the excess material. Securing it down with binder clips (I used six in the end) keeps it nice and stable and flattens out any curving in the surface. The only issue with the binder clips is that very occasionally if I don't check the hot ends path prior to the print, it will pass over the end of the clip and snag. 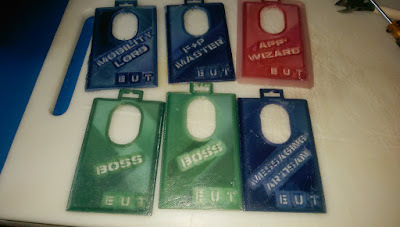 I've learned to review the tool path prior to prints for this reason now, and remove any clip that might get in the way. As I mentioned previously, I needed to find a solution to allow the inductive bed levelling probe to work. Aluminium foil kind of worked, but not reliably enough to trust. I tried folding it into squares and even pasted the entire bottom of the Tufnol with the stuff, but gave up after a couple of homing disasters. So, more density required for the metal on the landing areas, but still flat and thin enough that the hot end won't catch on it and rip it off. 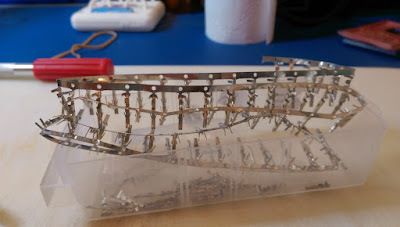 After several failed tests with coins, copper clad PCB and other bits of metallic junk I had laying around, I ended up cutting several strips support material from a reel of Molex pins that I had in my spares draw. Once the pins are removed, the thin tin covered copper strip is normally discarded, however I found that this is just the right density to trigger the inductive probe reliably. By running a very slow G29 command on the printer, I was able to line up a couple of 1cm strips side by side at each of the landing points, which I then glued down onto the board in the pattern you see in the pictures. This has proven to be very reliable. The next step was ensuring that the Nylon stuck to the Tufnol. 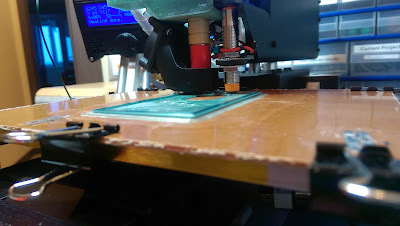 Again, on small thin prints of only one or two bottom layers I had no issues either keeping the model on the bed, or removing it afterwards, however my ID passes were still contracting and warping, even though the Tufnol offers excellent adhesion. So, back to the glue stick again. I've found that a fresh and liberal coat stops any warping whatsoever, even with one test which covered the whole 150x150mm bed with several layers of nylon. Of course, removing the object now requires a craft knife (an Exacto for all the US readers) but providing it's done carefully, the models come off intact. Being water soluble, the glue stick residue comes off the bottom of the model under a tap. kitchen scrubbing cloth. A quick wipe down with IPA solvent after that and it's ready to go again. 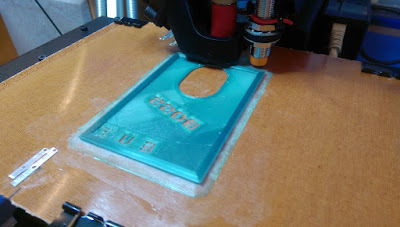 I also had to play with my probe offsets for the G29, and ended up going with a -0.8mm setting - normally when printing directly onto the heated bed, I'd been using -0.7mm, but this was giving a bit of a 'smashed' look to the first layer.